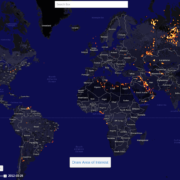 The wasteful practice of flaring off natural gas from oil and gas fields is again making news, coinciding with a new release of SkyTruth’s Global Flaring Map that visualizes gas flaring activity around the globe. This map relies on the Nightfire data provided by NOAA’s Earth Observation Group, which has written extensively about their work detecting and characterizing sub-pixel hot sources using multispectral data collected globally, each night, by the Visible Infrared Imaging Radiometer Suite (VIIRS) aboard the Suomi-NPP satellite. Read about the algorithm that creates Nightfire data here and methods for estimating flared gas volumes here. NOAA has published two additional years of flaring data, allowing our map to extend back to March 2012. A location search box lets you go directly to a city, state, country, landmark, etc. Date range selection helps you limit the visualization to the time-frame of interest. You can identify your rectangular Area of Interest and download flaring data within that AOI (works best in Chrome browsers). We’ve caught up with NOAA’s daily download after adjusting to recent changes in their web security. Please read about some of the uses for this map and how SkyTruth processes NOAA’s data in this original post describing our map. If you don’t see a flaring detection you expected to see, consider the caveats: some flares don’t burn hot enough to be included in our dataset, they may not have been burning when the satellite passed overhead, the flare may not be frequent enough to make it past the 3 detection threshold, heavy clouds may have obscured the flare from the sensor, etc. If you find this map useful, drop us an email at info@skytruth.org to let us know. In November 2016 the Interior Department announced a new Methane and Waste Prevention Rule to reduce wasteful flaring and leaks of natural gas from oil and gas operations on public and Indian lands. Although Congress tried repealing the rule after the 2016 elections, that effort failed to advance out of the Senate after a May 2017 vote. Despite the Senate’s action to keep the methane rule, the Environmental Protection Agency just announced (as of 6/15/2017) they would suspend implementation of the rule for 90 days — an action leading environmental groups claim is unlawful. Angola has experienced rapid offshore oil development over the last two decades. Much of this development has taken place in offshore Block 17, described as Angola’s ‘Golden Block.’ It is made up of four major hubs – Girassol, Dalia, Pazflor and CLOV (the Cravo, Lirio, Orquidea and Violeta fields) – which were brought into operation between 2001 and 2014. 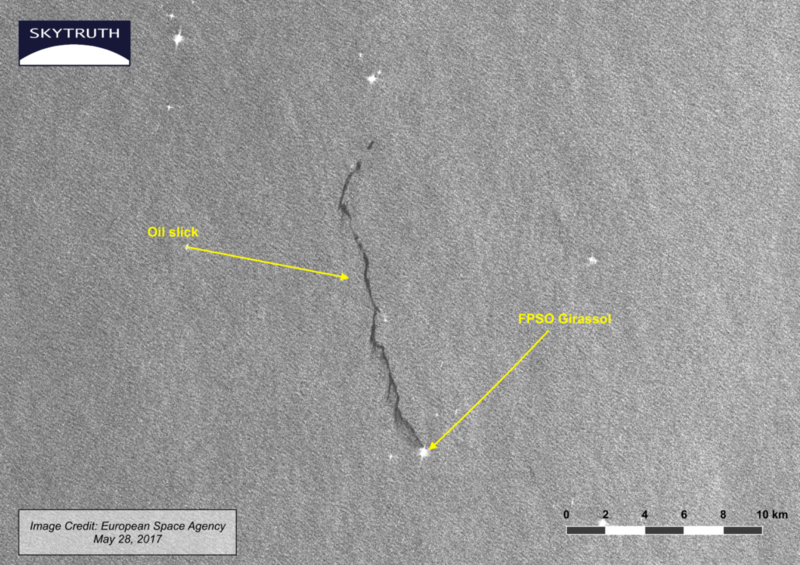 This image, collected on May 28th by the European Space Agency’s Sentinel-1 satellite, shows what appears to be an oil leak from FPSO Girassol, one of four floating production, storage, and offloading units (FPSO) operated by Total in Block 17. 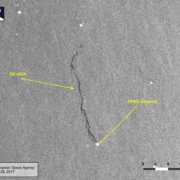 We also found what appears to be oil coming from the FPSO Girassol on May 16th and May 25th, suggesting that there may a chronic leak from the FPSO Girassol or one of the 39 wells and miles of pipelines that connect its two satellite fields – the Jasmim field, located about 4 miles away, and the Rosa field located nearly 9 miles away – and vast subsea production network. We’ll be keeping an eye on Block 17 and the Girassol Field as Total continues to ramp up production there – and in the ultradeep waters of Block 32 further offshore. It’s an exciting time around the office. We finalized our summer research program and added a couple of new faces—interns Brian Wong from Duke University and Flynn Robinson from West Virginia University—to help us expand our skill set and cover more ground. Brian is helping us improve our mountaintop removal (MTR) mining work. We’ve already mapped the footprint of MTR in 74 counties in Kentucky, West Virginia, Tennessee and Virginia. Our analysis used 30-meter resolution images from the Landsat satellite, and it computed mining footprints on an annual basis. But thanks to an exciting partnership with Planet, we now have access to satellite imagery collected daily with a resolution less than 5-meters. This is a game-changer. This new imagery will let us calculate more accurate and timely impacts of MTR in the Appalachians, and we’re excited to have Brian leading this work! Flynn is helping us improve our natural gas flaring work. 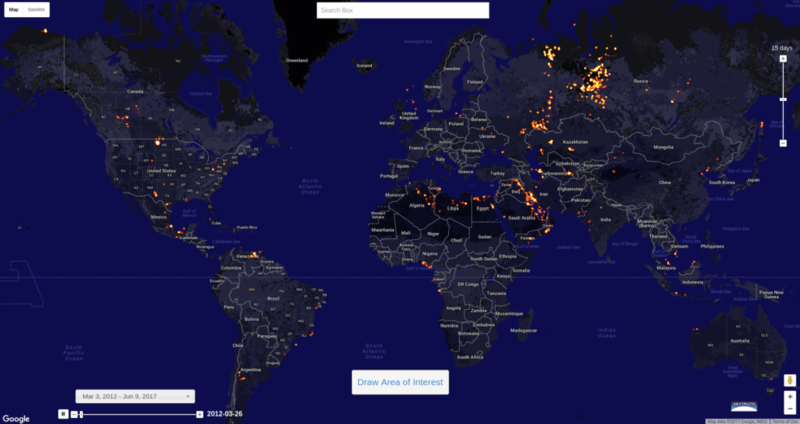 We’ve already mapped the distribution of natural gas flaring across the globe. But the data set that we’ve developed isn’t able to account for clouds or other natural “noise” that can throw off the sensor and create false detections. Yet. 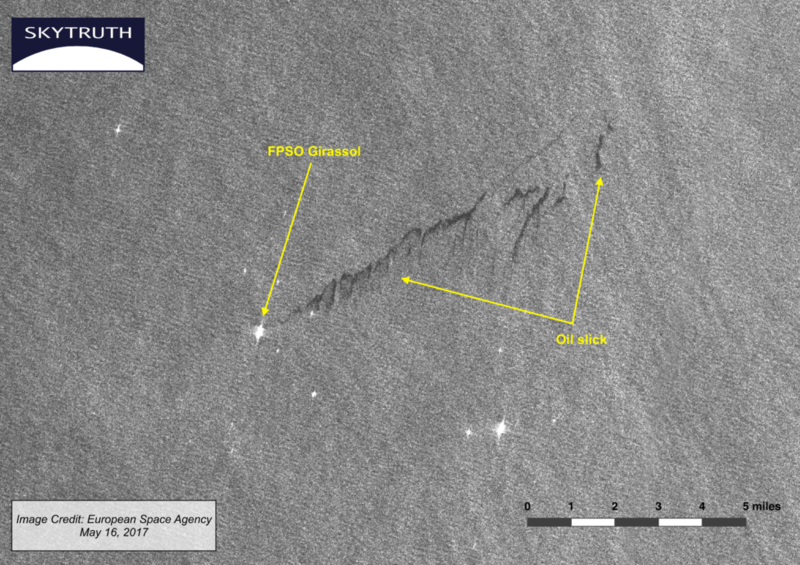 But we’re excited to have Flynn leading the effort to validate our flaring data set using the newly available imagery from Planet! We’ll be able to identify flaring events with much greater confidence and if everything goes to plan, send out ‘Flaring Alerts’ so that people can know when a new well is coming online near them. We’re also very fortunate to have Brady Burker stay with us through the summer. Brady will also be helping us to improve our MTR work. He’ll be adapting the approach that we developed in the Appalachians to map the impact of coal mining in Wyoming’s Powder River Basin. Brady’s work will also help deepen our understanding of mining reclamation. Using the data that he creates, we’ll be evaluating the effectiveness of reclamation – looking at whether the environment can return to its previous level of ecological health and productivity. As far as we know, our research will be the first to use a remote-sensing approach to measure reclamation effectiveness, and we’re excited that Brady will be leading this effort! Monitoring for offshore oil spills and tracking the impact of hydraulic fracturing will round out our research priorities this summer. We’re excited about the opportunities to create and share these powerful data sets, apply them to real-world conservation problems, and generate public and policy engagement that can make meaningful change. Thanks for staying around, Brady, and welcome to SkyTruth, Brian and Flynn! Today, a big announcement was made at The Ocean Conference at the United Nations: the Republic of Indonesia has made its fishing activity data public by allowing it to be published in Global Fishing Watch. This is an unprecedented move — governments that require vessels to use their proprietary vessel management systems (VMS) typically restrict access to the system; data is made available to government and enforcement agencies but not the general public. But Susi Pudjiastuti, the head of Indonesia’s Ministry of Marine Affairs and Fisheries (the Kementerian Kelautan dan Perikanan RI, or KKP, for short), believes that making government fisheries data visible to the public is a powerful way to engage civil society in the fight against illegal, unreported and unregulated (IUU) fishing. View a larger version here. Minister Susi is calling for other nations to follow her lead, and the Global Fishing Watch partners are committing to process, for free, VMS data from any country that agrees to make its data public through Global Fishing Watch, for free. Her decision is already making a difference — yesterday at this conference, the Republic of Peru announced (Spanish version) that it too will commit its VMS data to Global Fishing Watch in the near future. We hope that other countries will realize the advantages of transparency and soon follow suit. Today’s announcement is the culmination of two years of behind-the-scenes work with the KKP. In 2015, during a visit to Google headquarters, Minister Susi saw a demonstration of Global Fishing Watch given by Brian Sullivan of Google Oceans & Earth Outreach and SkyTruth’s Paul Woods, and she expressed interest in having a similar tool that her Ministry could use in fighting IUU fishing. Paul said that he thought such a collaboration might be possible, but that because AIS is generally not used in Indonesian waters, it would be necessary for the KKP to make its own VMS data available to GFW in order for there to be any data to work with. Remarkably, Minister Susi agreed. Since then, SkyTruth team members have made several trips back and forth to Indonesia to work with KKP staff — processing the data and applying algorithms already used for AIS to the VMS data, and sharing insights about the data with KKP staff that they can use to identify illegal activity and manage Indonesia’s globally important fisheries more effectively. 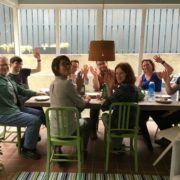 Meetings via Skype and Google Hangouts had to be scheduled early in the morning and late at night so that they could span the vast number of time zones occupied by team members in Europe, the Americas and Southeast Asia. SkyTruth hired Imam Prakoso in Jakarta to meet regularly with the KKP, and recruited Aaron Roan, a former Google engineer, to work with the data and the algorithms. 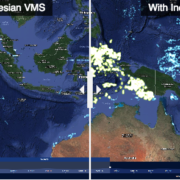 Starting today, Indonesian VMS data will be part of Global Fishing Watch and available to anyone who wants to view it; the VMS data will be updated daily. In addition, the KKP has been given its own mapping tool to use for monitoring fishing in Indonesian waters. The Indonesian VMS fishing activity data is shown on a separate layer, so that it can be turned on and off as the user wishes. We’d like to give a shout out to the people and organizations that made today’s announcement possible: to the teams at SkyTruth and Global Fishing Watch, to Global Fishing Watch partners Google and Oceana, and to Minister Susi and her staff at the KKP. 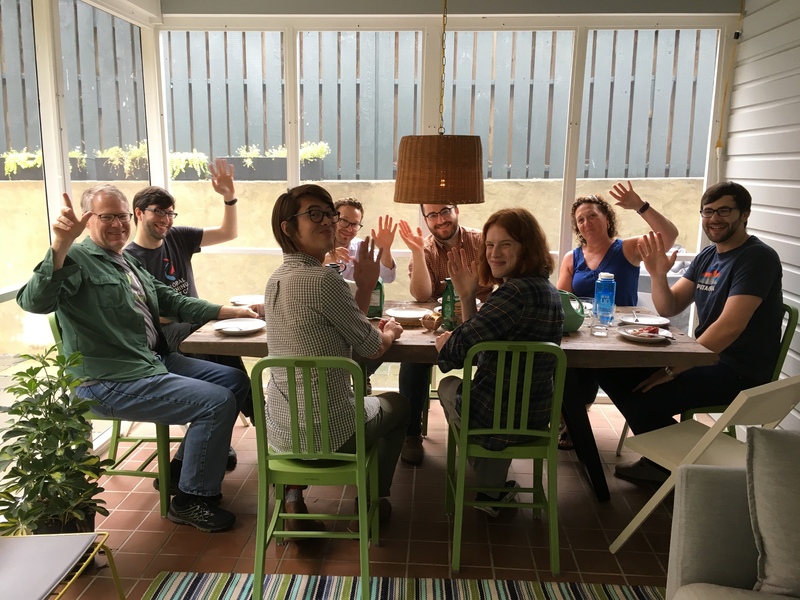 SkyTruth’s participation in this major effort is made possible by grants from the Walton Family Foundation and the David and Lucile Packard Foundation. 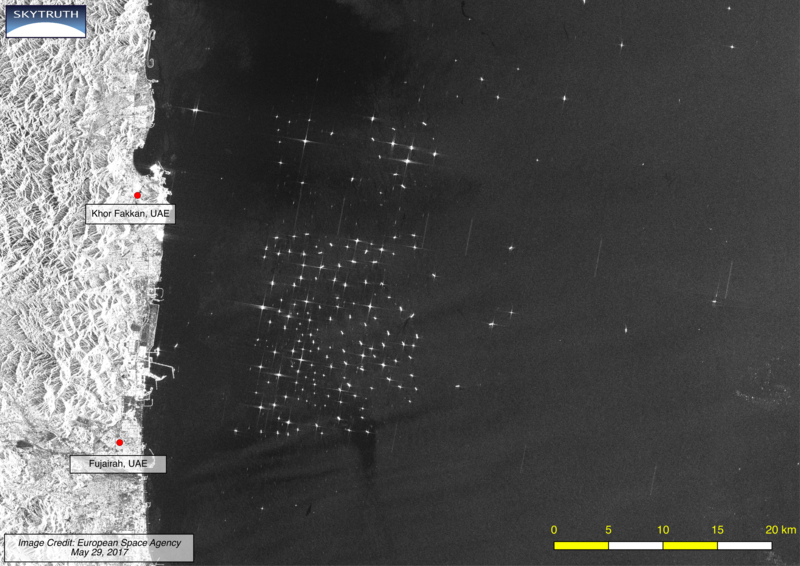 15 kilometers (about 9 miles), off the coast of Fujairah and Khor Fakkan in the United Arab Emirates is a popular tanker parking lot. Tankers anchored offshore of Fujairah and Khor Fakkan in the UAE. There is no issue with this, until you consider the fact that it appears to be the cause of persistent pollution problems for the UAE. There have been 4 spills in the past 3 months and local communities are getting fed up as these spills impact both local businesses and the environment. 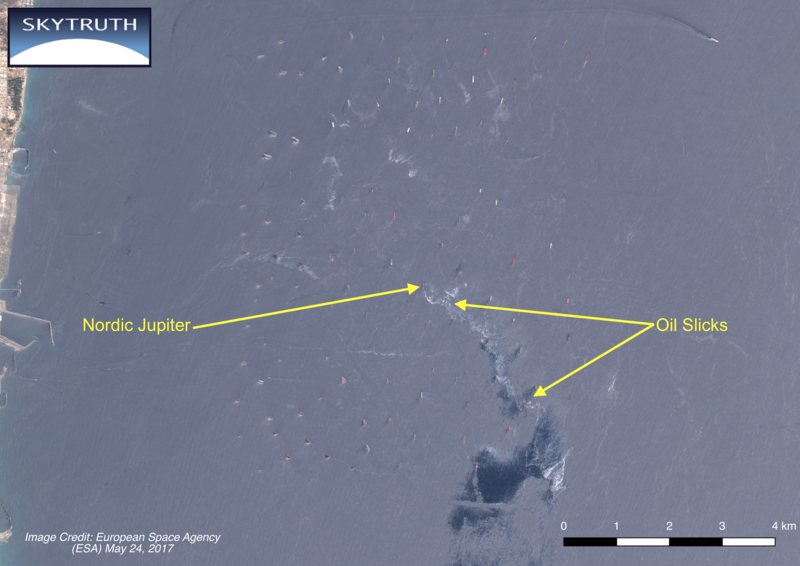 This image, collected on May 24, by the European Space Agency’s Sentinel 2 satellite shows the Nordic Jupiter, one vessel which was anchored offshore as well as oil slicks visible on the surface of the water. While we don’t know if the Nordic Jupiter is the source of this slick, it seems likely based on this image. 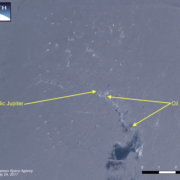 The Nordic Jupiter and oil slicks off the coast of the UAE. Occasional overflights by enforcement agents would be more than sufficient to police this parking lot, to deter future dumping, and to catch violators.